The Illinois Railway Museum has announced the tentative schedule for steam locomotive operations during 2018. 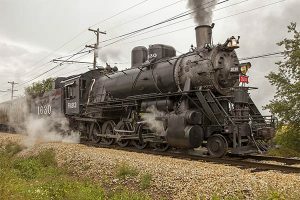 The museum’s operating steam engine, Frisco 1630, is currently scheduled to run on the following dates, contingent on mechanical and other considerations. Depending on available funding and volunteer time, the museum hopes to operate J. Neils Lumber Company 5 sometime during 2018 but significant restoration and assembly work on that locomotive remains and no specific dates are planned at this time. All train operations are subject to change without notice.